Fabulous offerings from rare, historically relevant archaeological pieces to new, exciting, highly collectible fine judaica art work. Judaism as practiced and expressed through Judaica Arts and gift items is attracting the interest of more and more people. Those of Jewish ancestry who have strayed into other cultures and religions in their previous lives are turning back to their roots by acquiring Jewish-inspired arts and gifts to renew their devotion to Judaism. Even non-Jewish people are showing their fascination with Judaica arts and gifts as evidenced by the brisk sale of these items in stores located in largely non-Jewish neighborhoods. This phenomenon could be attributed to the religious renaissance that all the lawlessness and inequities in the world have given rise to. We see people from all social classes and cultures trying to learn more about Jewish life and get connected to their forgotten heritage in a more intimate way. We even hear of some Hollywood celebrities joining Jewish converts and returness to go deep into the study of Kabbalah. Kabbalah is an ancient Jewish wisdom that reveals how the universe and life work. Most of us at some point feel that fulfillment is elusive and there’s something missing in our lives. Through the study of Kabbalah, we learn how to achieve fulfillment and serenity. Each one of us desires fulfillment and joy which could explain the interest many are now giving to Judaism and its promise of spiritual richness and deliverance. Apart from the study of Kabbalah, worship in the oldest of all known religions is practiced with the aid of synagogue items, Judaica arts and Jewish gifts. 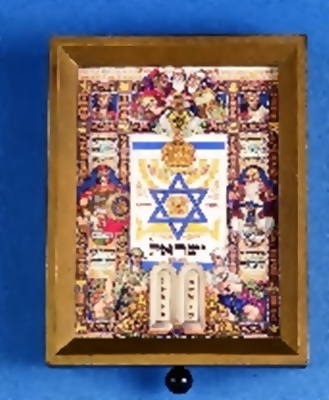 The world of Judaica encompasses virtually all possible objects pertinent to Judaism. It comprises mainly but not exclusively of articles that are inseparable parts of the religion, such as the Judaica Tallit. This is the prayer shawl that Jewish men wear when they pray according to their custom. Most Ashkenazi Jews wear the Tallit everyday once they get married, while Sephardic Jews wear it daily long before they tie the know, usually once they turn 13 years old at their Bar Mitzvahs. Another Judaica object that is not only an intrinsic part of Judaism but also immensely popular in Judaica stores is the Mezuzah. This is a scroll enclosed in an elaborately designed case on which is written religious passages from a Jewish holy man. Hence, the Mezuzah is mostly attached to doorposts of houses to signify the homeowner’s religiosity and also to ward off evil. Some Mezuzah can cost a pretty penny depending on design and make. 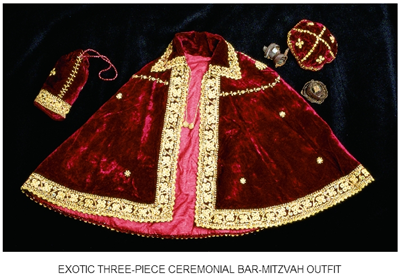 Decorative Mezuzahs are not the only example of fundamental religious items that Judaica offers in an array of colors and styles. There is also the famous Kippah, known by its Yiddish term Yamaka. This is the small skullcap Jewish men wear on their heads at all times symbolic of their subjugation to God. Judaica stores offer Kippahs in many different colors, sizes, shapes and materials. Judaica offers anything from vital ritual items to antique jewelry of Jewish motif, Jewish art and Judaica gifts. Jewish gifts are inexhaustible, with new items inundating the Judaica market constantly. Gift giving is a wonderful way to increase the sense of closeness between family and friends. Gifts are given on countless occasions in Judaism; food packages on Purim, gifts on Hannukah, milestone gifts for girls and boys reaching Bat and Bar Mitzvah, gifts for newly married couples who are setting up their home, and so many more. Apart from the pleasure of giving and receiving a gift, Jewish gifts and Judaica gifts have an additional aspect of being deeply meaningful and often being items that are passed from generation to generation, strengthening the chain of Judaism within the family. Judaica items that are given as presents today become the heirlooms of tomorrow – Kiddish Cups, Mezuzahs, Shabbat Candlesticks and Passover Seder Plates are all examples of items that are passed on from father to son, from mother to daughter over the generations, appreciated, cherished and admired. 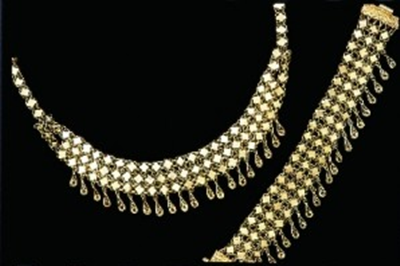 Jewish Jewelry is a category of Jewish gifts that is developing and growing at an astonishing speed. From traditional symbols, such as the Star of David and Chai symbols to the more contemporary Kabbalah and Hamsa, Jewish Jewelry is a popular way for Jewish people to display their Jewish pride and sense of unity. Rings, pendants, earrings, pins and necklaces can be found in an array of styles in our Jewelry collections, made of a variety of materials, silver, gold, ceramic, plastic resins and others. For more information, please visit Joy Schonberg Galleries. This entry was posted in Judaica Arts and tagged antique jewish gifts, antique judaica, antique judaica arts, Antique Judaica paintings, archaeological items, Chanukah lamps, Elijah, Fine art, Hollywood, jew, jewish antiques, Jewish ceremonial art, jewish gifts, judaica, judaica arts, judaica gifts, Judaica lithographs, Judaism, Kabbalah, Kiddush cups, Kippah, Mezuzah, Orthodox Judaism, Passover items, Passover Seder, Shabbat, Spice boxes, Torah ornaments, United States, Virtual. Bookmark the permalink.